LaborPains.org | Do You Stand With Dougco Kids? When a Washington D.C. union boss comes to town, take notice. If that boss promises to come back again, take cover. “This is not my first trip to Colorado, and it won’t be my last,” said Randi Weingarten of the American Federation of Teachers (AFT). Weingarten, the former head of the AFT’s New York City local, isn’t just visiting the Rockies for vacation. New York magazine said that as Gotham’s teachers union president, “Weingarten ha[d] the power to stop education reform in its tracks, or at least slow it to a virtual halt.” And now Weingarten is ready to throw AFT’s weight around in Douglas County, Colorado and block innovative education reform. The folks in Douglas County, home to one of the top public school systems in the country, are in for a nasty union-money-fueled battle in the weeks and months ahead. And that’s why we want you to join us and Stand With Dougco Kids and support them in improving their education, not dragging it backwards. Teachers Union Exposed, a project of Center for Union Facts, just released a commercial that alerts county residents to the attempts by the Douglas County Federation of Teachers (DCFT)—an AFT-affiliated union—to block innovative reforms. AFT’s Weingarten is one of a kind—or at least that’s what she says. She told the New York Sun in 2008, not long before she left for D.C., “Anybody who thinks that they can just walk into New York City and become the next Randi Weingarten is smoking something.” Likewise, if a high paid union boss ($407,323 to be exact) who backed the Chicago Teachers Union (CTU) strike thinks she can just walk into Douglas County and become a credible voice on the school district, she should take note of some of her own wisdom. 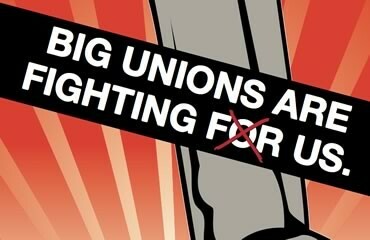 That’s right: DCFT and the CTU are all under Weingarten’s AFT umbrella. The CTU is the union that blocked the school house doors when it took a “strike of choice” against Chicago students for seven days. For Weingarten, it has always been about teachers union power. Weingarten even pushed for a 22 percent raise for New York City teachers in November 2001, as the city was still reeling from the 9/11 attacks. 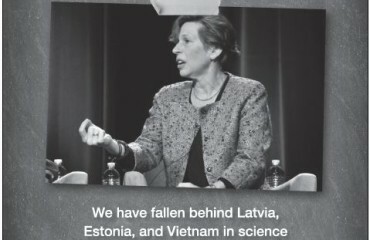 And if Weingarten wants to talk about who is being political, we’ll have that conversation. In its recently-released disclosures, the AFT headquarters in D.C. said it spent over $21 million on political activities and lobbying in the past fiscal year. That’s down from the $31 million it spent the year prior. If Weingarten and the AFT think Chicago-style politics will work in Dougco, they’re wrong. We hope that you will Stand with Dougco Kids today.